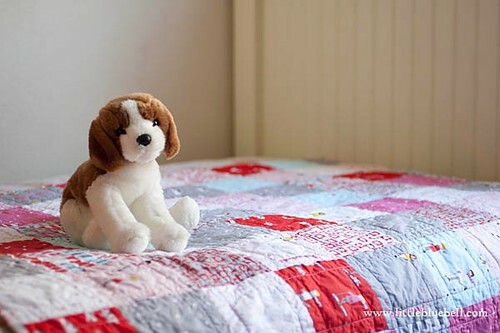 How am I supposed to follow up a blog post about a $600 quilt? With a charity quilt of course. ; ) There were some really good points made in the comments yesterday. Comments about how your pricing affects others, different products might have different profit margins, and most crafters and quilters don't sell their quilts wholesale. 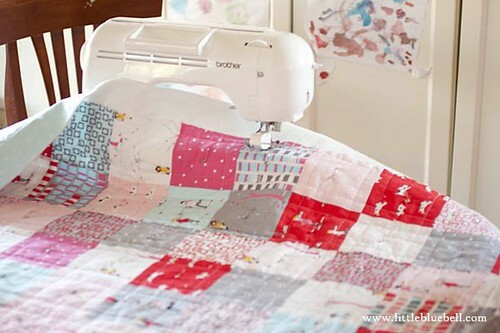 Most importantly remember that you make quilts because you LOVE it. So here we go. Hot off the sewing table... "Charming Sherbet Pips". 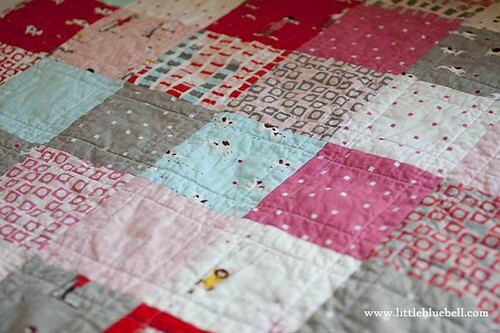 I loved making this quilt!! The charm packs were so cute on their own I didn't need to add anything. Hey, some days you're a cook and some days you're a chef. Today, I enjoyed being a cook. I could just sit down, sew, and let my mind wander. It felt wonderful. I used this quilting guide for the first time and it worked great. Just slide it into your walking foot, and presto, a straight line guide that goes beyond the width of your foot. Yahooie! 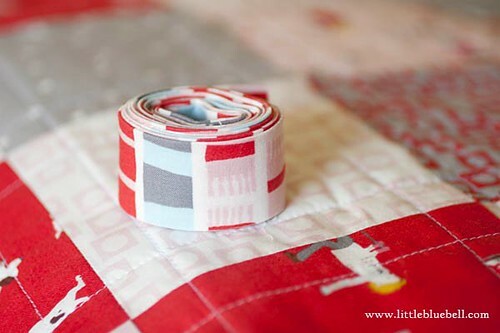 As soon as I saw this cute scarf print I knew I would use it as a binding on a quilt. I also attached the binding with my machine instead of by hand. *gasp* I know! It wasn't nearly as scary as I thought and I finished a lot faster. On the other hand, there was no snuggling underneath, watching (or listening to) a good movie, rounding the corners and finally a finish. Different tools for different days. My daughter was eyeing this laid out on the table and thinks we should keep it there, "Mama, it makes the table so pretty". She's right, but this quilt is destined for the 100 quilts for kids project going on now at Swim, Bike, Quilt. Beautiful!!! The quilt and the gift it will be! Cute, I've got two charm packs and some yardage in my "to do" pile. I need to get moving on it. sweet finish Adrienne:) I have one of those guides,but never use it. I bought a hera maker recently so perhaps I will take that out for a test drive soon. It's beautiful! I love my guide too, it's super helpful. And I love the choice of binding. super cute. 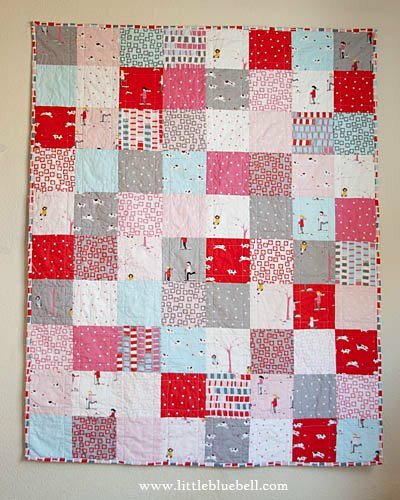 Somedays there's is nothing better than cooking up a fast quilt, and you can't really beat simple squares for a perfect kid's quilt, can you? Makes me want to eat some sherbet ice cream!